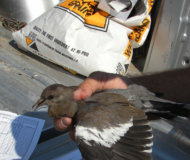 “We need dove hunters to report banded birds they harvest to the Department. 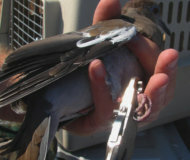 Each band has a free 800 phone number that hunters may call and report the location of the harvested bird. At present we are getting poor returns – maybe folks don't know to call us when they find a band on a dove's leg. 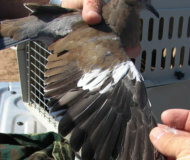 The bands slide up in the feathers of the upper legs and maybe folks are not seeing them," Dickerson explained. Doves are incredibly prolific reproducers. Doves begin to nest in March, and continue to nest until November. Every six weeks another two young are produced, and one female might have as many as 5 clutches in a year. “Their ecological role is to be prey. They are born to be eaten, and humans are just one of their predators. Hunting has not caused any decline in the various dove species," Dickerson explained. He continued, “According to our long-term survey data using a coo count method, it appears there is a gradual decline in mourning doves. Biologists with Texas Parks and Wildlife are currently being trained to use a different method of surveying that removes some observer bias. 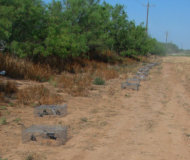 If the birds are indeed declining some possible reasons include large scale chages in existing habitat, actual loss of habitat due to agriculture and human developments, and possibly increased competition with the White-winged Doves and the Eurasian Collared Dove that have moved into West Texas in the last decade or two." The Eurasians just showed up less than 10 years ago, while the whitewings came in the early 1980s." Dickerson knelt at another trap, opened the trapdoor and grabbed another whitewing. When I went with him at 10.30 a.m to his trapline he caught 49 whitewinged doves, 3 Eurasian doves, and no mourning doves. 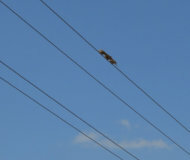 “On the early run this morning, at 8.30 a.m., I only caught 10 mourning doves, and nothing else. The two species seem to be picking different times to utilize this artificial food source. I have not witnessed any physical battles between the species here, but folks have told me they have seen whitewings chase mourning doves away from food at backyard feeding stations. With the increase in Eurasians, maybe the mourning doves' access to food and water is being limited. Maybe the mourning doves are being pushed out into the ranch country, and anywhere there are trees and plentiful water, the other species being taken over." 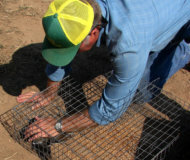 Dickerson talked as he pulled doves from the traps. 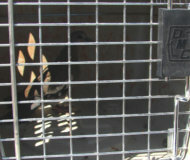 Dickerson placed ten to 15 doves in a pet carrier before carrying it back to his pickup. There, he would pull out a dove and stretch a wing out to count the primaries. “See, on this one, the fifth primary is shorter. The last one it was the 10th primary, and the one before that the 2nd primary was shorter. They molt from the inside, the 1st primary." 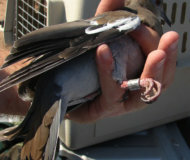 After he placed a band on the bird's right leg and released it, he pulled out another dove. “This one just left the nest recently, for it has all of the primaries, but you can see the white tips on the covert feathers, which appear only on juveniles. It has not started to molt yet. It takes 133 days for doves to complete their juvenile molt." The doves never made a sound. I used to help my mother band birds and I remembered how most species squawked and bit as we pulled them out of the mistnets. Dickerson told me that the doves never bit him. The next one he pulled out of the pet carrier already had a band. He read the number off it and wrote it down. We caught 5 recaptures on the 10.30 run. 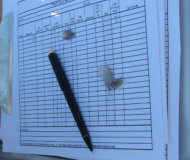 As he processed the doves a few down feathers off of the chest would detach and flutter in the breeze. “Like any form of trapping, there is always a little damage, but losing a few feathers does not hurt them. I don't trap in the hot afternoon – if they stack up in a trap they often pack together and the heat would get to them, or the one on the bottom would suffocate. When Dickerson finished with a dove, he would hold his arm out and drop them. Before a bird fell even a few inches it would flap its wings and fly away. 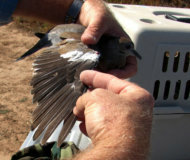 Most of the released birds only flew into the mesquites less than 50 yards away. One flapped a few times and landed on the barbed wire fence 20 feet away. When he placed one on top of the pet carrier, it just sat there as long as we remained motionless, but when we moved, it zoomed away. 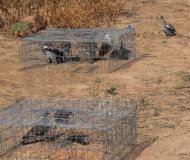 As he processed the birds, more doves fluttered in to sit on an electric line not far away, peering down at the traps, and some even dropped on down to the ground near the traps. “I have caught a few great-tailed grackles and scaled quail in the traps, but never any of the lark sparrows we saw along the road as we drove in. I caught a Diamond Dove recently – an escaped cage bird. I do catch young cottontail rabbits. Sometimes the cottontails run against the walls of the trap and scoot it along the ground until it hits a clump of weeds and causes it to rise up so they can get out. I have found traps 50 feet away from where they were placed. Trapping is illegal for the general public – you can see why – the birds are easy to catch."